This 6 x 4 recovery vehicle is fitted with a 4 cylinder petrol engine of a similar type to that fitted in our Leyland turntable ladder fire engine GLW 419. 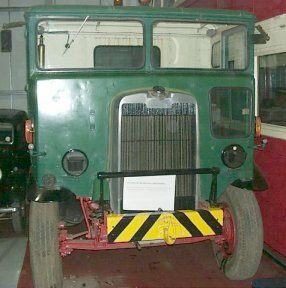 Following the success of Leyland's lorries in military use during World War 1, Leyland supplied many further vehicles to the military in the 1930s and during World War 2. The 2 axle rear bogie was designed by the War Office, and the design made available to any manufacturer of miltary vehicles. About 6,500 Retrievers were built in the 1930s and 1940s, seeing a wide variety of uses including as mobile cranes, mobile workshops and searchlight units. One (now on display at the Imperial War Museum, Duxford) carried General Montgomery ("Monty")'s office caravan through much of the campaign in Europe. Other than the fact that it originally had an open cab, the 'active service' history of our Retriever is unknown. After the end of hostilities, many military vehicles were sold for further use - some seeing military service in other countries, this example passing to the Buckfastleigh Garage Company, Devon, and it was heavily modified and converted into a breakdown truck. At this time, vehicles used by the motor trade, and operating wholly on 'trade plates' were exempt from registration, so it has never carried a civilian registration number. left - Retriever in the act of retrieving Lincoln No. 5 (VL 1263) from the museum yard prior to No. 5's restoration.